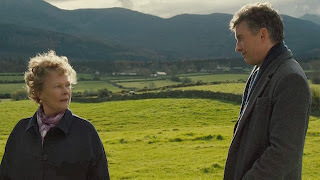 Steve Coogan, versatile actor/comedian plays triple duty as producer, writer and star of a movie based on the non-fiction book The Lost Child of Philomena Lee, by BBC correspondent Martin Sixsmith. Directed by Stephen Frears (The Queen) it was co-written by Jeff Pope. Judi Dench plays the title role in what may be considered a front runner for the Oscars and dash the rumors that she is quitting acting due to her deteriorating eyesight. A beautiful, heartbreaking, yet ultimately hopeful in it's forgiveness. Coogan plays Martin Sixsmith who just lost his journalist job at the BBC tells everyone that he's going to have time to work on his book about Russian history. So when he's asked to do a human interest story he dismisses it as derivative distraction for the masses. But he's encouraged by a publisher so he goes to see Philomena who had been forced to give up her child as a teenager while living at at convent home. On the child's 50th birthday, Philomena came clean to her daughter about the brother she never knew existed. Philomena never forgot about her son and has never stopped searching for him. With Sixsmith's help they go to the abbey where the nuns are not forthcoming claiming all the records were destroyed in a big fire. Later they discover that the abbey had been selling the babies of it's wayward teen residents to Americans. Soon they are off to Washington DC to piece together the puzzle. Philomena at first is like a ordinary Irish country housewife. Seemingly daft and unworldly. But as the story progresses Dench reveals the layers of of her emotional resources. She is accepting of the life that fate had dealt her. While Sixsmith is cynical and angry over the unfair and morally wrong behavior of the nuns and the Catholic Church. Philomena's attitude, her light and guileless personality annoys Sixsmith at first. But their growing rapport is movie magic chemistry of the actors and their ability to make the characters believable and endearing. Philomena loves romance novels and offers Sixsmith a play by play review of the story, she also remains faithful to the church despite what has happened to her and she is completely candid to the buffet servers at an all you can eat buffet. She baffles Sixsmith, at the same time he's drawn to her and helps her all he can. The bittersweet mystery of what happened all those years ago, and the eventual conclusion will not leave a dry eye in the house. Philomena's true life adventure to close the door on a part of her life that was unfinished is grounded by Frears able direction allowing the actors to convey the depth of their mutual empathy and the healing power of forgiveness.